1. Less is more; strive for believability, not perfection. A modest correction will usually produce a more natural looking finished image. Leave the major work to the retouching pros. 2. Consider the final use; 1″ x 1″ yearbook image won’t merit the same level of work as a national magazine cover shot. Use your zoom tools to review the image at various sizes before busting your schedule needlessly. 3. Busy backgrounds are a common but correctable problem. Try softening them and making subtle lightness/darkness adjustments to achieve a simpler looking finished image. 4. Save work by training your photographers. Poor lighting and misused on-camera flash are some of the most common offenses. A few minutes of education can save hours of retouching work. 5. Always work on a calibrated monitor. 9 out of 10 people have their displays set far too bright and blue. Copies&Ink offers a FREE calibration test CD you can use to evaluate how your on screen images will will print. Just drop us a line. Have a similar project or questions you’d like to share? Feel free to add a comment ordrop us a line. A wide screen under your tree? If you’re still using a 17″ display, perhaps Santa inadvertently missed your chimney. Today’s publishing (and general computer work) demands require a lot of monitor real estate. A 20″ or greater display should pay for itself quickly in saved time, not to mentioned reduced eyestrain. 2. While big displays are now much more affordable, they should be considered consumer units, not suited for high end color work. So consider your needs and expectations before making the investment. It might be worth considering an Apple Cinema display or other mid to high price unit, if your need exceeds that of pleasing color. What’s in your design studio? How has it worked? Drop us a line or a comment! There is a light in the darkness. It is love; it is joy. love and grace, of giving and of renewal. joyously expressed again and again, in countless ways. ever-present purpose that drives every other purpose. are. Give love, give joy, and you have even more. December has been my month to travel cross country; if you’ll indulge me, I’d like to share a highlight of my trip. There is, and could only ever be one New Orleans. My family’s trek across the country gave us a day to savor the city’s unique flavor. The Red Fish Grill provided a dinner I’ll remember for years to come. Check out their double chocolate bread pudding for dessert. OMG. 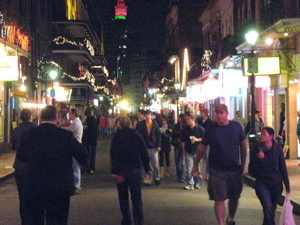 The real treat came with a stroll along Bourbon street. It was buzzing with activity, even on a Wednesday night. Music streamed out of practically every doorway. 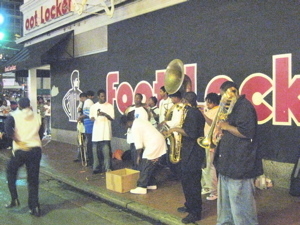 We were awed by a makeshift brass band which took up residence on a street corner. Their robust almost cacophonous sound, a funky, updated tribute to traditional dixieland playing was at once honest, vital and virtuostic. Most amazing of all, none of group appeared to be older than a teenager. Beyond the French Quarter, one doesn’t have to look far to find evidence of Hurricane Katrina. The local newscasts still feature stories of the many struggles this proud city still faces. What an embarrassment that such destruction and poverty can continue to persist so long after the hurricane. This is our country, these people our citizens, this music our heritage. Dear Lord! It’s been a wonderful trip. Still, we’re looking forward to being home, and sharing the holidays with friends and family. On behalf of the everyone and Copies&Ink, I’d like to extend warm and wonderful holiday wishes along with a healthy and prosperous 2008.